Blaney was in a class of his own Sunday. He not only earned the best finish of an Open team in 2016, besting his own mark of 5th at Kansas, but was a factor in both the start and end of the race. Blaney started 7th, but ran a close 2nd to Tony Stewart in Saturday’s first practice, trailing by just 0.123sec. He was 4th for the final restart with nine laps to go and found himself crammed between leader Chase Elliott and 6th-place starter Kevin Harvick, nearly wrecking all three. Kyle Larson, who started 2nd, was also shoved by Brad Keselowski, but caught traction first and went on to score the victory. Blaney, the only driver in the Top 7 to not lead a lap Sunday, now sits 18th in points, fourth among winless drivers outside the Chase. He has two races left to win his way in. Next week at Darlington, Blaney looks to improve on his 30th-place finish last year driving a David Pearson throwback. A distant second among Open drivers was Cole Whitt. Whitt lost the first of his six laps on the 51st circuit and came home two and four spots ahead of the remaining two Open drivers. Next week, Whitt looks to make his fourth Darlington start for a fourth different team. The defending last-place finisher of the Southern 500 has finished no better than 38th at the track, and the Premium Motorsports team does not as yet have “throwback” schemes announced for either driver. The Vydox Plus scheme returned at Michigan for Sorenson, who finished seven laps down on the same circuit as Pocono winner Chris Buescher. 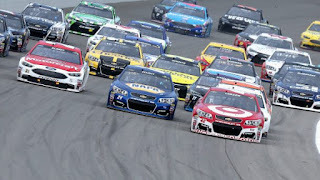 In seven previous Darlington starts, Sorenson’s best finish was an 11th in his track debut with Chip Ganassi Racing, which took the checkers Sunday with Kyle Larson. It will be his first start at the track since 2014, when he ran 39th for Tommy Baldwin. When Buescher managed to hold off Joey Logano before the competition caution, Josh Wise earned the first Lucky Dog on Sunday, but he wound up eight laps down on the same circuit as Jeffrey Earnhardt. Wise briefly ran 40th on Lap 110, but gained two spots by the finish following the late-race struggles of Clint Bowyer and Landon Cassill. Wise has three previous starts at Darlington with a career-best 21st coming in his most recent outing for Phil Parsons Racing in 2014. According the team’s Twitter poll, Wise is slated to run a throwback to Michael Waltrip’s 1988 Country Time Pontiac next Sunday. None of the other part-time Open teams attempted the race in Michigan.